Sanga Wellness delivers an array of workable wellness solutions in South Africa. 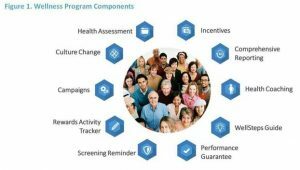 * Employee Wellness Solutions: This include Assessment, Goal Setting Tools, Activity & Incentive Trackers, Behavior Change Tools, Evaluation and Incentives. * Performance Guarantee: Our Wellness solutions have a performance guarantee. * Behavioural Solutions: Our solutions are based on behavior change science - our wellness solutions produces results. * Health Solutions: Our health and wellness solutions reduce costs, risks and change behaviour in the workplace. * Activity & Incentive Tracking: A wellness activity and incentive tracker for wellness rewards. Read more about the WellSteps Corporate Solution here. Contact us to see how we can Improve Employee Health & Reduce Medical Costs within Your Company!